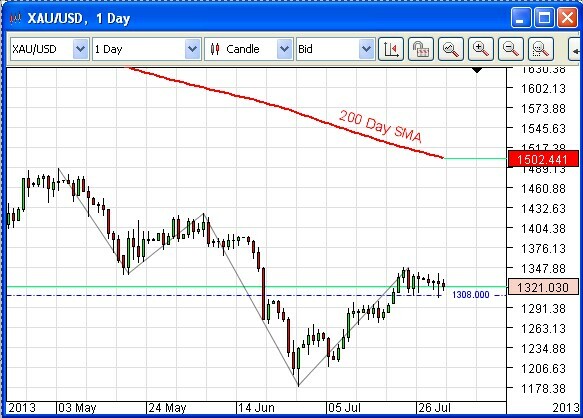 OmiCronFX : Is gold about to provide us with some profit? Is gold about to provide us with some profit? As we know, it is impossible to foretell the future. To try to get over this we always attempt to have probability on our side. Now consider where gold is at the moment in terms of US dollars per Troy ounce, on the chart above. It has been trending down, forming lower highs and lower lows, and the 200 Day Simple Moving Average (SMA) is in a decidedly downward slope. Right now it could be at another lower high, so there is at least the possibility that the immediate future path is down. So in either event there would seem to be a probability that gold will decline from here, at least in the short term. 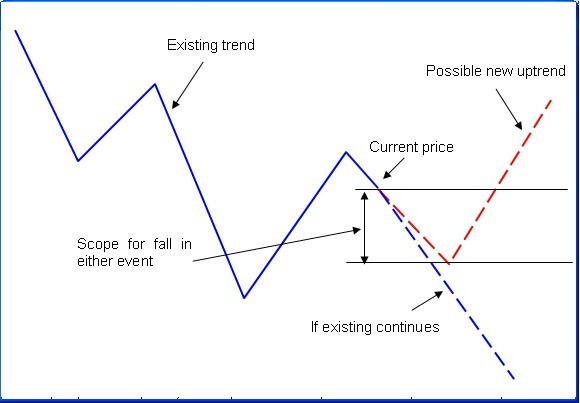 A well structured trade, one that is designed to take a reasonable profit, protect against losses and which allows for the possibility that the downward move will actually continue, could have a higher than normal probability of succeeding. The Omicron Forex Silver Trigger Algorithmic trade entry and management system has all of the above requirements built in, and can ensure the high level of discipline that is needed to effect a desirable outcome. There is also the fact that gold is at a local support level in the daily chart, at 1308.00, and is showing signs of possibly breaking through it to the downside. As always, of course, probability also means that any given trade can fail. It is the aggregate profit and loss from many high probability trades, over time, that makes for sustained profitability. About Omicron Forex: We provide deep resources for Foreign Exchange traders in the form of Fundamental Analysis, Technical Analysis, Algorithmic routines (for JForex, MT4 and MT5 trading platforms) for the entry and management of trades, Training Courses in Foreign Exchange Trading using the UDUTU Learning Management System (LMS), which can be accessed in the Cloud on a truly global basis, and books on Foreign Exchange Trading. The Omicron Forex Trading Manual is available on all Amazon sites worldwide. To maintain the integrity of our offerings we do not carry advertising on any of our sites. While we have relationships that allow us have access to the Application Programming Interfaces (APIs) of a number of Foreign Exchange brokers to enable us to develop our Algorithmic routines, we do not endorse any particular broker and we do not act as introducing agents for any brokers.